Mountains are especially vulnerable to climate change, so scientists are keeping a close watch on species such as the American pika (Ochotona princeps). This small mammal, which resembles a hamster and is a relative of the rabbit, lives in alpine and subalpine terrain across Western North America. 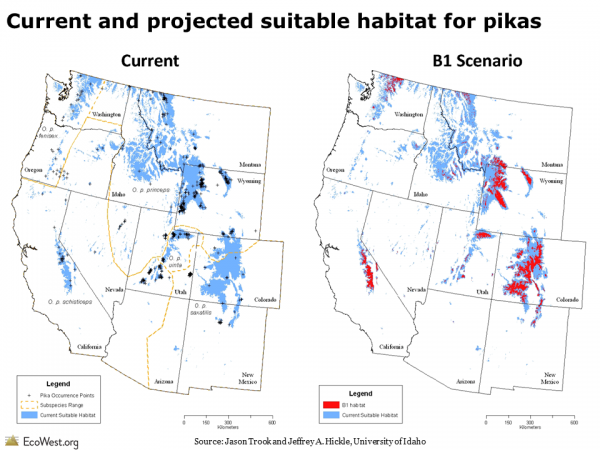 Although relatively widespread and usually found in protected public lands, the American pika is considered an indicator species for climate change and may face a challenging future. These cute critters are super-sensitive to heat and can die in a matter of hours is exposed to temperatures of 78 degrees or above. As the mercury continues to rise in the decades ahead, pikas and many other mountain species are expected to ascend in elevation in search of cooler conditions—what’s been dubbed the “escalator effect.” But mountains eventually top out at a summit or ridge, so plants and animals can only climb so high. “The pika is toast,” is how environmental law expert J.B. Ruhl opened his 2008 Boston University Law Review article on the challenge of administering the Endangered Species Act in an era of climate change. Although some scientists and conservation groups remain deeply troubled about the pika’s prospects, recent research on the species has suggested it may be more resilient than previously thought. Because pikas are photogenic and mountains are at the heart of the American West, I thought they would be fitting subjects for our first EcoWest video, which is embedded below (you can also watch on our Vimeo and YouTube channels). This is a new format that we’d like to explore further, so I’d welcome any feedback from viewers. Escalator effect: climate change and mountains from EcoWest on Vimeo. Pikas live near sea level in parts of Western Canada, but in the United States they’re found much higher up. In places such as Nevada and Southern California, they’re rarely observed below 8,200 feet. In North America, as one moves southward toward warmer climes, pikas live at progressively higher elevations. Here in Colorado, pikas are a common sight on talus slopes around treeline (roughly 11,000 feet) and above. The five-ounce animals blend in well with the boulders and scree, so you’re likely to hear them chirping first. But they’re not hard to see in summer as they scurry to gather grass and flowers for “hay piles” that will sustain them through the brutal alpine winter. “Charismatic and conspicuous” is how the National Park Service’s Pikas in Peril project describes the animals, which were called “little chief hares” in the 19th century and are nicknamed “boulder bunnies” today. American pika in Indian Peaks Wilderness, Colorado. Photo by Mitch Tobin. Below is another set of projections from University of Idaho researchers. 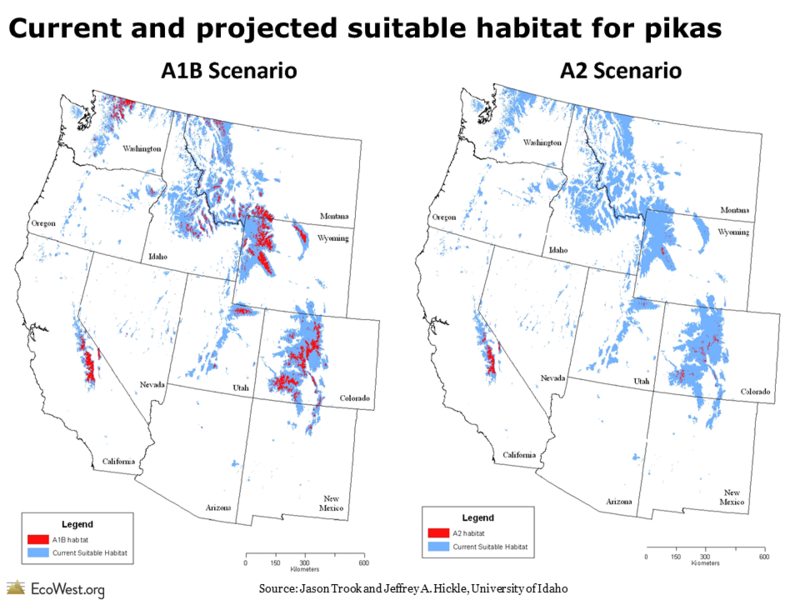 These maps show the pika’s suitable habitat under three climate change projections: B1 is an optimistic scenario for greenhouse gases, A2 is pessimistic about our ability to contain carbon emissions, and A1B lies in between. According to this study, higher emissions and warmer temperatures will shrink the pika’s range. Besides increasing heat-related stress, global warming could, paradoxically, cause pikas to freeze to death. If warming temperatures thin the snowpack, the animals will have less insulation during the winter, when they retreat beneath the surface but don’t actually hibernate. In a place like the Great Basin, where climate change is projected to boost summer temperatures and shrink the winter snowpack, pikas face a “perfect storm,” the IPCC says. A 2011 paper in Global Change Biology concluded that the extinction rate for pikas in the Great Basin had increased nearly five-fold over the past decade. 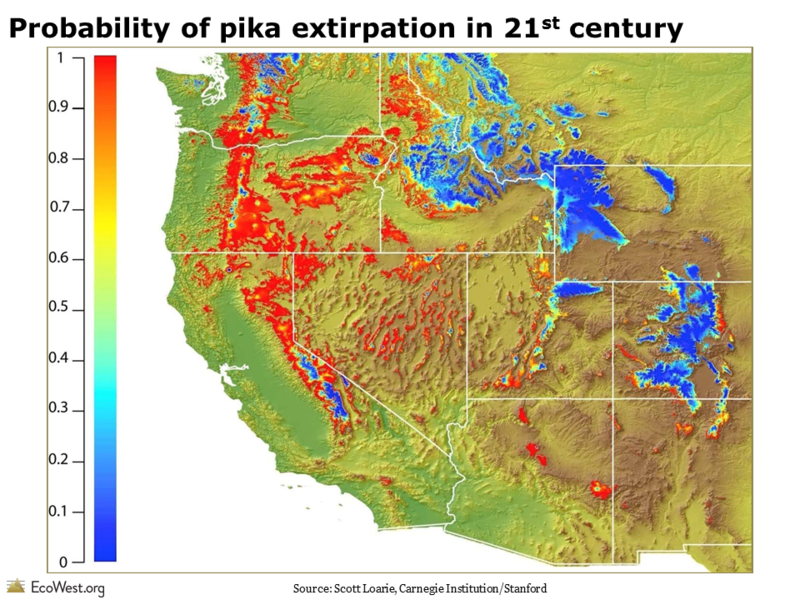 Examining 25 sites with historical records of pikas in the 20th century, the researchers found that nearly half of the local extinctions had occurred since 1999. Pikas in the Great Basin have been moving upslope at an average rate of nearly 500 feet per decade since 1999, 11 times faster than before (see this ScienceDaily story for details). While Great Basin pikas appear to be in deep trouble, other research in the American West has found that the species is adapting to the 21st century climate. A 2011 study of 69 historical pika sites in the Southern Rockies, some dating back more than a century, found the animals still present at 65 of the locations. Since the 1940s, scientists have been observing pikas living in ore dumps near Bodie, California, at about 8,400 feet elevation. “There appears to be no evidence that heat stress in summer at Bodie causes mortality or population decline of pikas on these small habitat islands,” the IUCN said, although warmer temperatures may have inhibited pikas from colonizing unoccupied habitat. 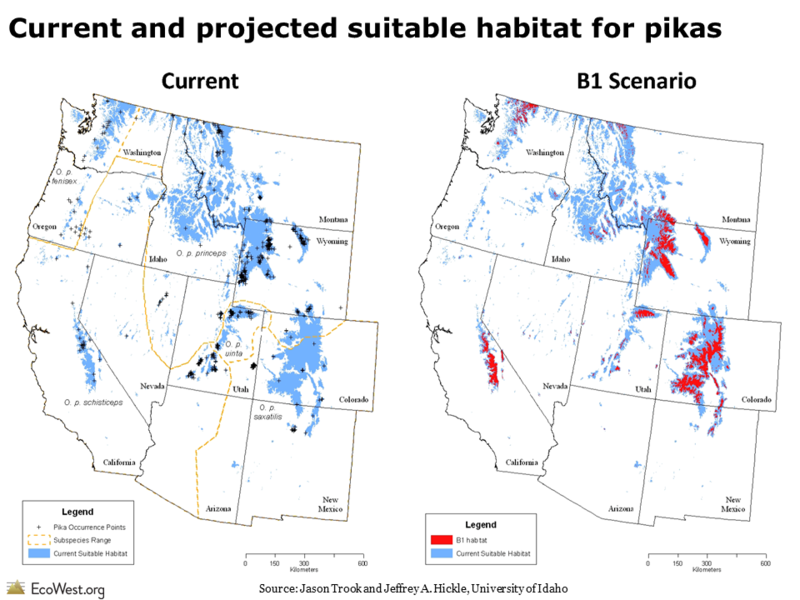 Despite the trends of increasing American pika declines in the Great Basin due to increasing temperatures, there is ample evidence that the species can survive and thrive in some habitats with relatively hot surface temperatures. American pika populations thrive at a lower elevation site in the mountains near Bodie, California and in the hot climates of Craters of the Moon (Idaho) and Lava Beds National Monuments (California). Pika persist at these sites because they reduce activity during hot mid-day temperatures by retreating to significantly cooler conditions under the loose rock areas and perform daily activities during the cooler morning and evening periods. Despite altering their behavior in response to high temperatures, pikas can maintain high birth and low mortality rates. That statement from the Fish and Wildlife Service came in response to a 2007 petition from the Center for Biological Diversity to list the American pika under the Endangered Species Act. Working with the National Oceanic and Atmospheric Administration, the Fish and Wildlife Service developed models to predict if increasing surface temperatures due to climate change would affect the pika (below the surface, in the crevices of a talus slope, temperatures can be as much as 43 degrees cooler). The history of the Endangered Species Act certainly has its share of political meddling (see my book Endangered for the full story). But in this case, listing the pika wasn’t a biological slam dunk, in part because the danger lies decades ahead. The Fish and Wildlife Service acknowledged the jeopardy, saying “climate change is a potential threat to the long-term survival of the American pika,” but it concluded that the threat wasn’t urgent enough to warrant regulatory action. 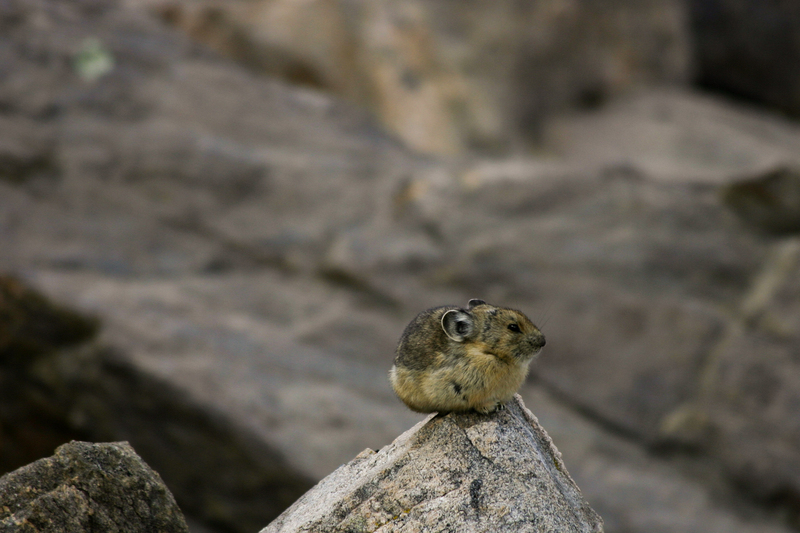 About 93 percent of the pika’s habitat is already under federal control and 30 percent is designated as wilderness. Pikas are just one of many mountain species that are being forced to adapt to climate change by moving uphill. 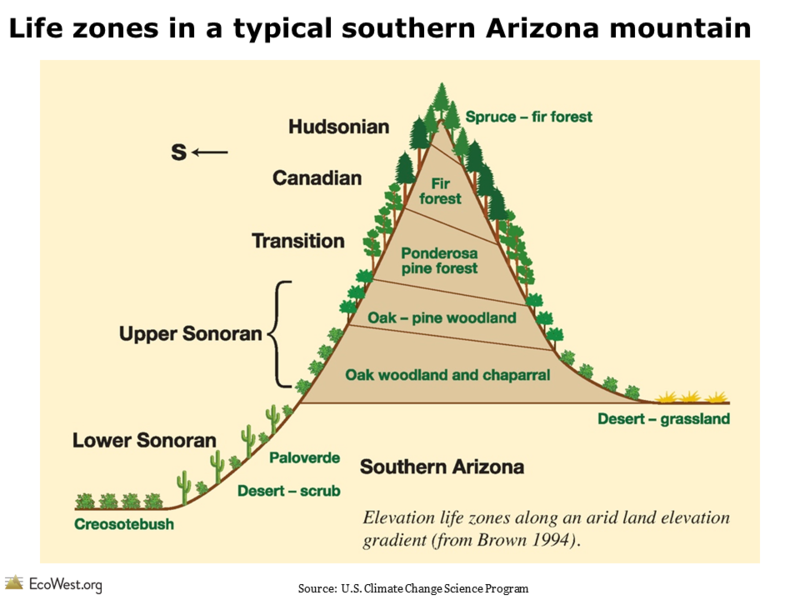 As shown in the figure below, a Southern Arizona mountain is a layer cake of life zones, ranging from the Sonoran Desert at the bottom to a spruce-fir forest at the top. Enough warming could push the top layers right off these mountains. Anyone who has climbed to the top of West’s tallest mountains knows that biological diversity tends to decline the higher up you go. Here in Colorado, the tundra above treeline is a harsh environment (it’s already snowing in September), so few species can survive. Yet many mountains are biological gems with large numbers of endemic species found nowhere else. “Although species richness decreases with elevation, mountain regions support many different ecosystems and have among the highest species richness globally,” according to the Intergovernmental Panel on Climate Change. Animal and plant species that live in the mountains are among those particularly sensitive to rapid climate change. They include animal species such as the grizzly bear, bighorn sheep, pika, mountain goat, and wolverine. 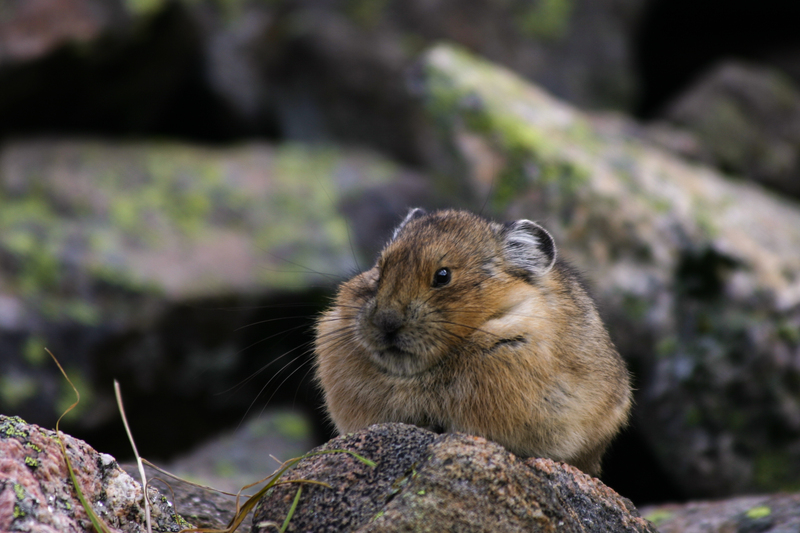 Major changes have already been observed in the pika as previously reported populations have disappeared entirely as climate has warmed over recent decades. One reason mountain species are so vulnerable is that their suitable habitats are being compressed as climatic zones shift upward in elevation. Some species try to shift uphill with the changing climate, but may face constraints related to food, other species present, and so on. In addition, as species move up the mountains, those near the top simply run out of habitat. In 2010, the Center for Biological Diversity also petitioned the Fish and Wildlife Service to grant Endangered Species Act protections to four other mountaintop species: the ‘i‘iwi, a Hawaiian songbird; the white-tailed ptarmigan, a grouse-like bird that lives in the Rockies; Bicknell’s thrush, a songbird from the Northeast; and the San Bernardino flying squirrel of Southern California. All of these petitions are currently under review. On balance, scientists see global warming as a threat to fragile mountain ecosystems, but some montane species may actually benefit from climate change. Marmot in Holy Cross Wilderness, Colorado. Photo by Mitch Tobin. Climate change will create winners and losers, not only among high-country critters but also in human society and the global economy. 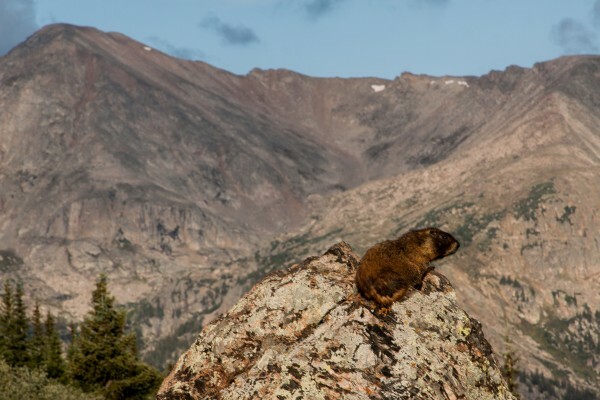 A resurgent marmot population will have implications for other species in their habitat, while any declines among pikas will affect their own ecological niche. As challenging as it is to predict the future range and behavior of one species, the situation gets even more complicated once you factor in the many interconnections in the web of life.